If you think rosé wine couldn’t possibly get any better, prepare to have your mind blown — or at least frozen. WASHINGTON — If you think rosé wine couldn’t possibly get any better, prepare to have your mind blown — or at least frozen. This summer, Pinterest boards, Instagram feeds and bar menus across the country are filled with a cool cocktail that’s become the darling drink of 2016. It’s frozen rosé, or frosé for short. 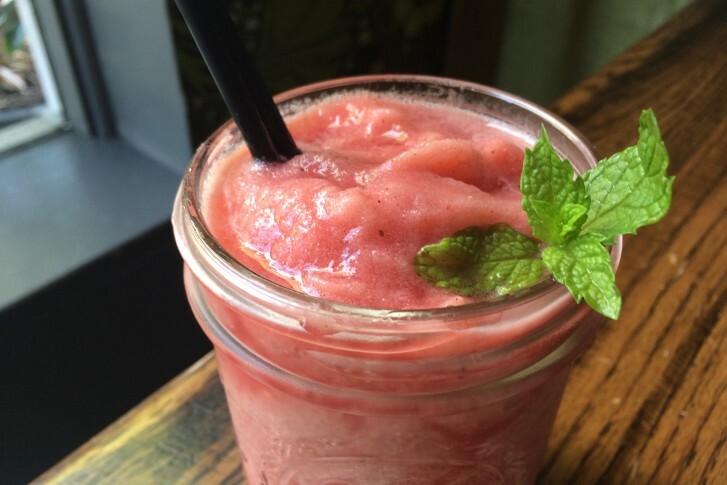 “On a hot summer day, the only way to get it better is to freeze it,” said Justin Sievers, the general manager at Bar Primi in Manhattan’s East Village, one of a number of restaurants that’s serving frosé this season. Earlier this year, Sievers and his team at Bar Primi purchased a frozen drink machine to make frozen negronis. When summer’s heat and humidity set in, the group started brainstorming additional uses for the gadget, and a wine-based drink piqued interests. “Even as an adult, you want something super cold and refreshing … Just because it’s a frozen drink doesn’t mean it has to be a sugary, sweet sort of drink, so we decided to do something that’s a little bit nicer,” Sievers said. They experimented with rosé, a pink-colored wine that gets its hue from the skins of red grapes. “[We said] it’s rosé season, let’s just dump some rosé in there and see what happens,” Sievers said. Bar Primi isn’t the only restaurant serving the frozen wine drink. In fact, several spots in the D.C. area are making their own, including Arcuri, Macon Bistro & Larder and Lyman’s Tavern, DC Eater reports. Food-focused magazines like Bon Appétit and Real Simple have also jumped on the frosé bandwagon, publishing recipes for the drink. If you don’t have a frozen drink machine at home, Sievers says frosé is still relatively simple to throw together — and perfect for summer’s hot weekends. The most important thing, he says, is to freeze the rosé ahead of time. Don’t just throw chilled rosé into a blender with ice. “That’s going to water it down and just kind of make the consistency not as nice,” he said. Rather, empty a bottle of rosé into a plastic container (preferably one with a lid) and freeze it for a few hours or overnight. Take it out when the texture is similar to a slushie. “You can scoop it out, almost as like a sorbet or granita, and that gives you your base of frozen rosé,” Sievers said. Then, throw in a little vermouth for flavor and strawberry puree for color and texture, and blend it all together. “It gives it a little extra body and flavor, because as you freeze rosé, it tends to kind of dampen some of the flavors,” Sievers said.